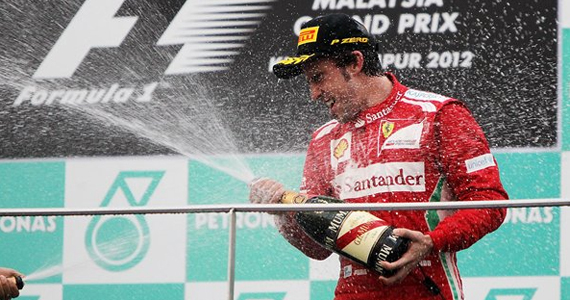 Papa Wheelie reviews the happenings at the Malaysia Grand Prix this weekend. All the teams went to Malaysia to sort out all the questions about where everyone was when it comes to pace. The season opener in Melbourne proved that this year is going to be very different than years past. Red Bull Racing is no longer supremely dominant, and many other teams are looking for blood in this year’s world championship. McLaren’s total lockout of the front row in the Melbourne qualifying translated to Malaysia qualifying as well with Mercedes powered cars pretty much owning the front part of the grid for much of the early part of the weekend. Mercedes are looking more and more like they are becoming a threat to the status quo, with both Michael Schumacher and Nico Rosberg showing flashes of brilliance in the practice sessions and qualifying. But ultimately, everything that started out that weekend washed away with the rain that came just before the start of the race. 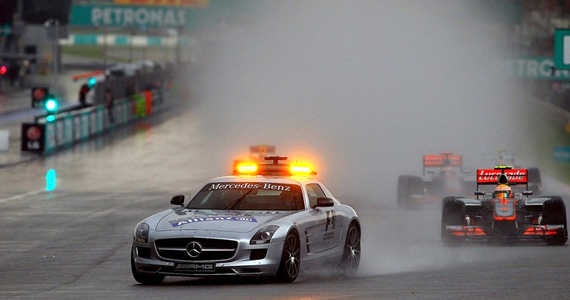 Right from the beginning, all hell broke loose on the grid with a wet weather start. Only five laps in, and every car was going for the full wet tires (the ones capable of displacing over 60 liters of water per second). After excellent qualifying efforts, Michael Schumacher and Romain Grojean spun and compromised both their races right from the go. Sergio “Checo” Perez was put onto the extreme wets earlier than everyone else, and when they came in during the heavy showers, Checo was running three seconds per lap quicker than anyone else on the grid, and making huge strides towards being in third place very early in the race. The showers got so bad that the race was eventually red-flagged and the teams waited for over an hour before resuming the action. After the restart, all the ground that Jenson Button had gained on teammate Lewis Hamilton was lost in a slight mistake and collision with Narain Karthikeyan’s HRT. Button’s race eventually collapsed after that, and he finished out of the points. Lewis Hamilton had a rough time in the pits and eventually lost out to Button and Fernando Alonso in key pit stop periods. Alonso had some great pit stops and really drove the tires off the Ferrari to get himself into first place. Eventually the fight came down to Checo and Alonso during the drying track period in the last third of the race. The Ferrari really started to show how hard it’s struggling in dry weather pace, as Checo immediately caught Alonso and lined him up for a pass for the lead. A slight mistake coming into the back straight cost Checo his win and he would have to settle for a career best second place. In the end it was Alonso that was victorious with a brilliant strategy-filled and really intense battle. Checo came in a close second, and easily had the pace to dispel Alonso, and would have if he hadn’t made that mistake. Hamilton closes out the podium and fails again to convert his awesome pole lap in to a win. Mark Webber had a relatively quiet race, but he brought home some much needed points for Red Bull Racing. Kimi Raikkonen continues his F1 comeback with another good points scoring weekend in 5th, followed by an awesome fight and points scoring finish for Bruno Senna, which really signals that the Williams team is firmly back in the hunt for points. Paul Di Resta, Jean-Eric Vergne, Nico Hulkenberg and Michael Schumacher finish out the points positions in really tight fashion, as all of them were fighting for position all over the grid throughout the race. Sebastian Vettel had a difficult race, with multiple fights and poor strategy calls related to his radio failure. 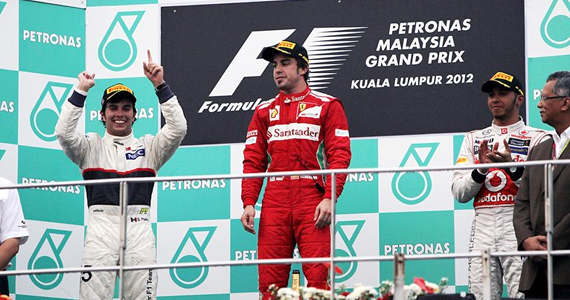 He eventually ended up in 11th after colliding with Karthikeyan in the closing parts of the race. I wouldn’t say Vettel was the chump of the race, as that honor definitely goes to Jenson Button. Despite having the car that could have easily won the race, mistakes under pressure and poor strategy calls gave Button a very tough day and he finished way outside the points. Malaysia was supposed to give us a better picture of where all the cars are in terms of pace, but rain is always the great equalizer. Ferrari has openly admitted that their car is not where they want it to be. Had this been a dry race today, they more than likely would have struggled to stay in the top six places. But Alonso really showed why he’s arguably the best driver on the grid at the moment. It’s much easier to take a competitive car, put it on pole and then win from the front. But to take an underperforming car, fight for grid positions and make the right calls at the right time to put yourself in a place that you can win is a whole other thing. Watching Alonso race today was a real treat, and shows why he’s easily one of the best drivers ever to race. Sergio Perez has long been touted as the successor to Felipe Massa at Ferrari, and today he showed his true form in a tough mixed conditions race. Hamilton and McLaren stayed in the fight for the last spot on the podium, but their race was average at best, as they easily have the best car on the grid right now. The championship picks up again in Shanghai in just about three weeks time, and I’m sure all of the teams are looking ahead to a more “normal” weekend.